I'd like to take time to celebrate a good friend of mine, who is having a special celebration of his own today. He has an unbelievable story of survival and inspiration. A story so powerful it will make you change how you go about your everyday life. To challenge you to live each and every day of your life to the fullest, and to make the most of your time here on earth. Cancer is a very scary word. A word that seems to touch us all directly in some way, no matter who we are. Our wife, our mom, our sister, our friend. You might even be reading this as a cancer survivor or going through treatments right now. I want to offer you a story of hope. The story of my friend Kyle Garlett is someone who has been diagnosed four different times with cancer and survived. Four times. That is incredible. Someone, who after surviving four rounds of cancer, and the many many hours of chemotherapy, radiation, and treatments, many thought he would not survive. His heart and body were so badly damaged beyond repair he was given a very short life expectancy and placed on the heart transplant waiting list in an effort to save his life. During this time his hip was replaced. His left shoulder was replaced. At one point a pacemaker was put in to regulate his heart (You can read about his medical timeline here). After five long years of waiting he receive a miraculous call from UCLA medical center (six years ago today October 10th) that they had his heart. A few short hours later he was in the operating room receiving his new heart. Amazing. It has been a long recovery, and for anyone, just getting back to some kind of normal everyday life would be a great end to an incredible story. But it's not. Kyle was not even close to being done. 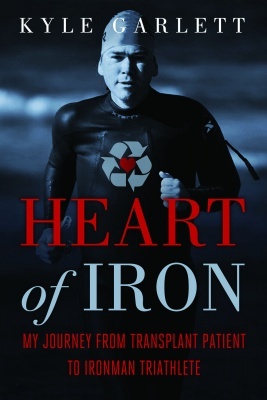 What if I told you that, inspired by his heart donor's ultimate gift of life, he decided to make the absolute MOST of his new heart by not only getting healthy and strong, but by making the decision to start training and competing in one of the most grueling and challenging races in the world, the Ironman Challenge. If you are not familiar with it, the Ironman is a triathlon consisting of a 2.4 mile swim, a 112 mile bike ride, and a 26 mile marathon in that order, and without a break. It is the ultimate test for athletes everywhere. Even for a very strong and healthy person with no history of ailments. His truly amazing story has now been captured and published into an inspirational book. His stories of overcoming, of cancer treatments, pain, trials, and fear mixed right in with experiences of hope and joy in the midst of everything. All of this and still managing to keep his flippant sense of humor throughout. His courage to press on through it all, to train and compete in the Ironman Challenge will inspire you to reach your own goals in life. By the way, when I met Kyle back in college he was already a 2-time cancer survivor. Having been diagnosed with Hodgkin's disease as a senior in high school, and then again two years later, he was re diagnosed with Hodgkin's as he was attending University of Missouri. When I met him as a Junior at Azusa Pacific University in California, in the University choir, he had the most hilarious sense of humor and a great outlook on life even way back then. We became fast friends. 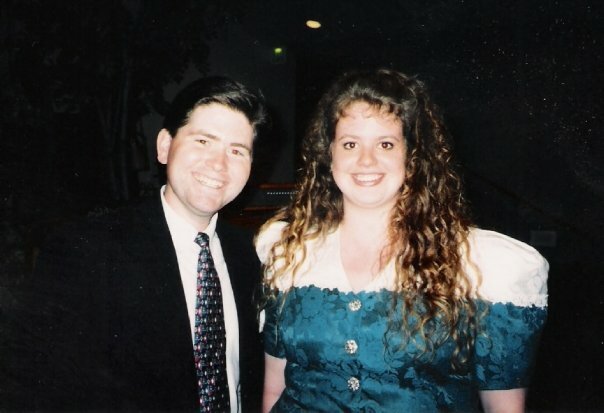 An old scanned photo of Kyle and I back in college choir. No worries, we were forced to wear those outfits and tour America with our giant hair. Shortly after we graduated he got the devastating news he had Hodgkin's for a third time. I had moved back to Washington, while he had stayed in California, to pursue our careers. A few years later he received the fourth and final diagnoses of Acute Lymphocytic Leukemia (ALL) that was actually caused by all the chemotherapy. Still he pressed on and recovered. Shortly after that he met Carrie (now his wife) and you might have even seen them exchange their vows on ABC's Extreme Makeover: Wedding Edition. He also ran the torch for the 2002 Olympic games, became a motivation speaker, and now works closely with the Leukemia & Lymphoma Society raising awareness for cancer research. All in all he has lived a very exceptional life with many more years and adventures to come. I am just very glad to be counted as one of his long time friends, and am extremely grateful to be able to wish him a very happy 6th birthday today! Check out Kyle's Ironman facebook page where he keeps you updated on his Ironman training and speaking events.